Here's a suit marker you'll be able to see from across the room. Unique faceted face design. A great gift for those card playing fanatics on at your bridge club. You'll never have to ask, "What's trump?" again! Perfect for use in bridge, whist, pinochle, euchre, pitch and other suited card games. These large solid maple suit marker cubes have faces laser engraved with the symbols for spades, diamonds, clubs and hearts plus "No Trump" engraved on one of the other faces and one face you can leave blank or for a small charge we can engrave it with your custom message up to 4, 30 character lines. These faceted 2-1/2" suit marking cubes are eco-friendly natural hardwood. Sanded smooth and machined into their unique faceted shape but absolutely NO PAINT, NO STAIN, NO VARNISH, NO LACQUER or any other sort of finish is used on these solid wood suit markers. A great "green" gift for any occasion or for use by card clubs and card tournaments. The suit marking cube has a round 2" engraving area on each face. All of our suit markers can be personalized. For just $5 more you can have the sixth face of your suit marker engraved with up to four lines of text. Perfect for bridge clubs, tournaments or promotions. 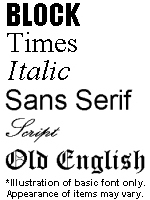 Just select your font from the six fonts we know engrave well (select using a drop down menu) then type your message text in the text boxes and we'll do the rest*. 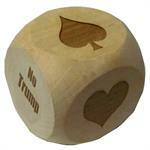 Solid natural hardwood - these suit marker cubes are made from solid hardwood. 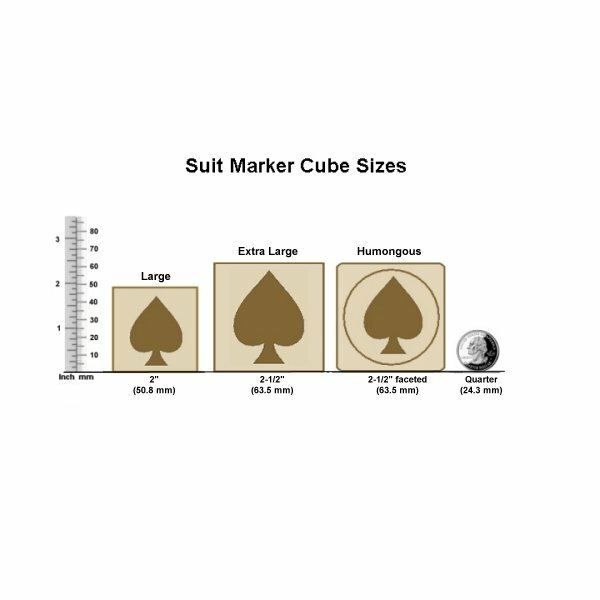 The suit marking cube has a round 2" wide engraving area on each sculpted face. Natural wood finish - Our suit marking cubes are sanded smooth on all sides and edges to eliminate any splinters, jagged edges or rough areas. And no paints, stains, varnishes, lacquers or any other type of finish are used. A great "green" product. Customize your marker - For just $5 more you can have the sixth face of your suit marker engraved with up to four lines of text. Perfect for club tournaments or promotions. Just select your font from the six fonts we know engrave well (select using a drop down menu) then type your message text in the text boxes and we'll do the rest*. 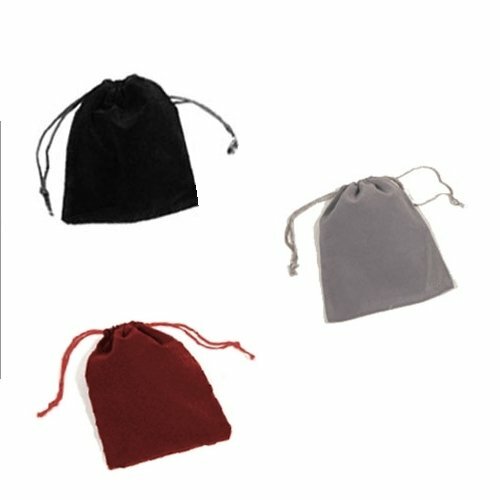 Quantity Discounts - order multiple suit marker cubes with the same engraving and your cost goes down. Great for card clubs and tournaments. 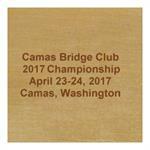 100% American Made - all suit markers are made from 100% American maple hardwood and 100% engraved in Vancouver, Washington USA. Delivery to meet your schedule - standard production is normally 1 to 7 working days from receipt of your order except for the holiday season from November 15 through December 31 when standard production goes up to 1 to 10 working days to accommodate our surge of holiday orders. NOTE: For orders larger than 25 pieces please give us call. Production times represent production time from our receipt of order to shipment; they DO NOT include shipping time in transit. 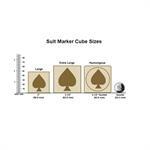 Make your suit marking cube into more than just a high quality gift. Our laser engraving makes it easy for you to customize the suit markers for any occasion. *PLEASE NOTE: The standard engraving options shown here are but a small fraction of the engraving we can perform with our state of the art laser engraving systems. Logos, pictures, names, messages, etc. can all be engraved. Engraved wood blocks make great promotional items - a unique paper weight or desk knick-knack with six faces on which to display your marketing message. 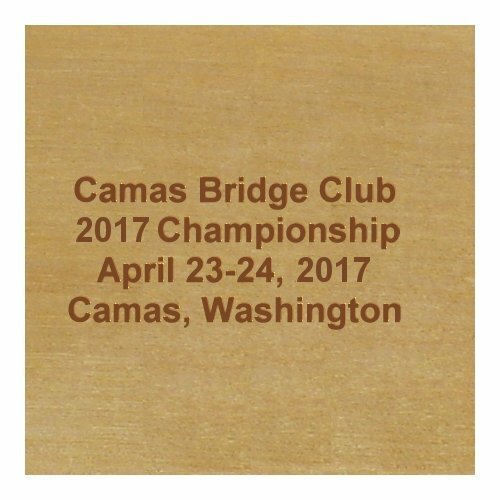 If you want fully custom engraved wood blocks, whether 10 or 1,000 or more for your next promotional product giveaway, contact us for details.